Earl Charles Chatfield Jr. passed peacefully at home on January 15, 2015 with his beloved wife at his side. Charles was born on March 11, 1934 in Philadelphia, PA to Earl Charles and Virgie (McGee) Chatfield, who preceded him in death. He is survived by his cherished wife and soul-mate Mary Frances (Poffenberger), and by their beloved family: son David Charles, daughter Carol Anne (Richard) Holmgren, sister Anelise (Bob) Smith, and grandchildren David and Ellie Holmgren, together with their in-laws Larry (Sondi) Poffenberger and Betty (Jim) Abbott, and nephews and nieces of whom he was very fond. Reared mostly in Oak Park, IL, Charles completed his senior year of high school in Monmouth IL, where he also attended Monmouth College. He earned his M.A. and Ph.D. in history at Vanderbilt University and undertook post-graduate study at the University of Chicago Divinity School. Charles was Professor Emeritus at Wittenberg University, where he taught for 38 years and held the H. Orth Hirt Chair in History. He directed International Education, 1975-83, creating and with Mary’s help directing a study-abroad program, “World Churches and Global Issues.” Charles served his country by helping recapture the record of organized effort in the cause of peace and justice (For Peace and Justice was his first book), writing, co-authoring, or editing several books and numerous articles, and thus helping to create a new branch of history. At the end of the Cold War he co-directed a joint Russian-American study of the ideas of peace in western civilization. 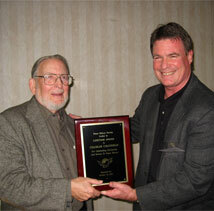 For his professional work he received the Lifetime Achievement Award from the Peace History Society, an Hon. Ph.D. from Monmouth College, and the 2012 Peace Hero Award from the Dayton International Peace Museum. Locally he served several church and service organizations. He relished the written word, theater and music, dance and travel, people, flowers, and egregious puns. A memorial service will be held at Covenant Presbyterian Church, Springfield on Saturday, January 24 at 11 am. Memorial donations may be sent to the Springfield Peace Center, P.O. Box 571, Springfield, OH 45501; Wittenberg University Department of History, P.O. Box 720, Springfield, OH 45501; or to Covenant Presbyterian Church, 201 N. Limestone St., Springfield, OH 45503 designated for Mission Outreach Fund. Littleton and Rue Funeral Home are serving the family; condolences may be expressed at www.littletonandrue.com. Charles was the recipient of PHS's first Lifetime Achievement Award - given in 2007 at Georgian Court University, where his remarks in receipt of the award and responses by Sandi Cooper and Blanche Wiesen Cook are recorded. Here are some articles about honors Charles received to get a glimpse of his impact.